Diabetic retinopathy is an eye condition that affects individuals who are suffering from diabetes. It damages the retina or light-sensitive part of the eye that’s responsible for visual recognition. It can result to vision loss and other eye problems such as vitreous hemorrhage, retinal detachment, and glaucoma. Diabetic retinopathy develops when too much blood in the sugar results to damage in the blood vessels in the retina. When this happens, fluid and blood leaks out of the vessels, which results to swelling in the retina, vision interference, and in worst cases, even blindness. During its early stages, diabetic retinopathy doesn’t manifest any visual symptoms, which makes early treatment of the disease challenging. Detecting and addressing the condition early on is crucial in preventing blindness or vision loss. Diabetic retinopathy is classified into two types—Non-proliferative diabetic retinopathy and Proliferative diabetic retinopathy. Non-proliferative diabetic retinopathy (NPDR) – NPDR refers to the early stages of the disease where the symptoms could be unnoticeable or non-existent. During this stage the blood vessels in the retina can develop microaneurysms or small bulges, which will result to the leakage of blood and fluid in the retina. Proliferative diabetic retinopathy (PDR) – PDR is the stage wherein the condition already progressed to an advanced stage. During this point, new blood vessels develop in the retina due to blood circulation problems which limits oxygen supply in the eyes. 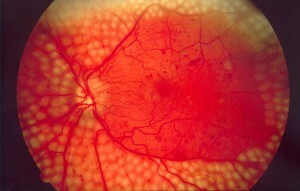 These new blood vessels can proliferate the retina and the vitreous gel. Blood and fluid leaks from them can flow through the vitreous gel and interfere with vision. As its name suggests, diabetic retinopathy commonly occurs among diabetic individuals, especially if the disease is not managed properly. People who are suffering from Type 1 and 2 diabetes are more likely to develop the eye condition. Race – Hispanics and Africans Americans are found to have a higher tendency of being affected with diabetic retinopathy. Women who suffered from gestational diabetes during pregnancy are at higher risks for developing diabetes as they grow older, which also means that their chances of developing diabetic retinopathy is likewise considerable. Other medical conditions – High blood pressure and cholesterol also adds up to a person’s risk for diabetic retinopathy. Smoking – Smoking is a common risk factor for a lot of diseases, and that includes diabetic retinopathy. Tobacco use contributes to an individual’s likelihood of developing the condition. Possibly, the best way to prevent diabetic retinopathy is to avoid diabetes. Otherwise, if you’re already living with diabetes, the best way to prevent its damage to your eyes is to follow your prescription, take the right medicine, have the appropriate diet, exercise, regulate blood pressure, and avoid habits such as alcohol and smoking. In addition, annual eye check-ups and examinations can also prevent the problem early on. Treatment will depend on the progression of diabetic retinopathy. If the condition is in its early stages, no treatment may be necessary, but the doctor may require regular and close monitoring of your eyes and good blood sugar regulation. Meanwhile, if the disease is in the advanced stages, treatments like surgery, laser treatments, and vitrectomy may be recommended. Do you suffer from diabetes? Don’t let it affect your vision and get tested for diabetic retinopathy today. Arizona Retinal Specialists can help you detect the condition early on and prescribe treatment appropriate for you. Please get in touch with us to set an appointment or learn more about how we help people live a good quality of life despite eye conditions.